Since I am working on a sci-fi right now, it is only fitting that, in my off times, I immerse myself in the fantasies of others. So the lore doesn’t get too grungy, right? While I’m finally re-reading The Wheel of Time before going to bed (at the current consumption rate, I will be reading the series for approximately two years), I decided I needed a break from the hard graft of game development during the day with a bit of Elder Scrolls action. 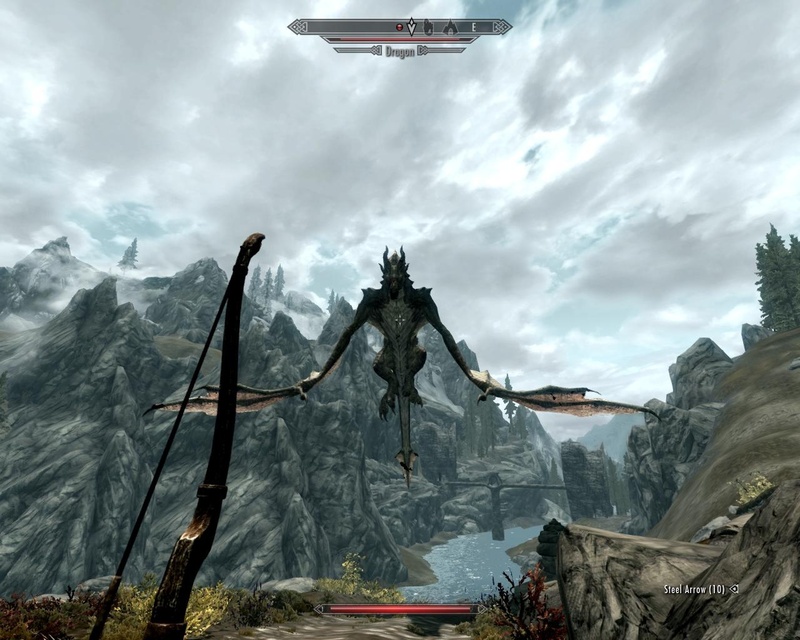 I’ve only played Skyrim once before, but I haven’t bought any DLC or added any mods. I just kind of… felt like giving it another go. This triggered a train of thought about “perks”. I am in two minds about perks. On the one hand, I like how they’re very… tangible. Along with the gentle upward trend in your abilities that comes as you use them, every so often you can unlock a whole new capability that can dramatically change how you interact with the world. That’s cool. The thing that got me was when my character, without even having seen a bit of Dwemer junk, let alone Dwemer armour, suddenly became able to forge the stuff. Hmmmmmm. Some perks might fit into this model, where you get so experience at something you work out how to do things; like moving more quietly in heavy armour. That can probably be learned with experimentation over a short but intense period. But smithing? I’m not so sure. I hope this blog doesn’t drag on too much. Crafting as a whole seems like a bit of a mixed bag to me. I kind of love it, all that halting your adventure to chip some iron ore out of the walls, but it seems to remove some of the excitement of discovering a new piece of equipment — nothing is unique, or rare, when by forging enough iron daggers you’ll discover how to make it. So I got to thinking how you could offset this. First, to clean up some of Skyrim’s massive reduction in dress-up options, I would say that you need to split smithing unlocks into two groups: materials and armour designs. Maybe I’ve picked up some Dwemer metal and managed to smelt it, but I don’t know how to create Dwemer armour because I’ve never seen any and/or there is nobody that knows enough to teach me. Despite that, I can still phyiscally work the metal, maybe making some normal plate mail from it instead. Maybe I never find out how to make actual Dwemer armour, so finding some actual Dwemer armour in the wild is still a Big Thing even though I can sort-of make my own. There are no conditions too harsh to stop me from getting those precious ores. Yeah. I find that I can improve existing Falmer equipment, but can’t craft it. This seems bizarre to me because, when I improved a Falmer shield the other day, it easily stood toe-to-toe with the Orcish shield I happened upon not long afterwards. Why can’t I learn to make Falmer shields, since they’re actually pretty damn good? I think there’s a bit of an imbalance here, and I guess it’s actually been there since Morrowind. Morrowind was much more of an RPG, in the sense that you mashing the attack button had no real effect on anything; combat was ultimately decided by invisible dice rolls, which, yes, often resulted in frustration as your sword refused to connect with some seemingly innocuous opponent. Oblivion truly stepped away from that by grounding combat in the game’s physical reality: damage might still have been stat-driven, but actually hitting people depended on, you know, actually hitting them. The block button appeared too, blocking becoming something you chose to do (based on your skill as a player) rather than something that just happened (based on your character’s skills in the game). Sure, it made combat more meaty and satisfying, but it stopped the game being so much of an RPG. Which is fine, and it’s a path I’ve trod myself with my own projects. When the Freedom Slips Away and This Wreckage had experience points and they unlocked things Just Because, but Project Y4 threw all that to the wind and based everything on physical things, trading dice rolls for simulation. It just feels much more natural to me. Oh, I’ve spent more time in Morrowind than you can imagine. See, when you’ve got something that’s not much of an RPG anymore, the leftovers become increasingly jarring. In Oblivion, there’s no room for casting failure, so even though you have 1 point in Restoration you can still easily get it off the ground with use. In Morrowind, your starting skills defined you and getting anywhere with so few points was basically impossible: you’d nary be able to cast that first spell to learn how to cast it better. That shift in emphasis makes it increasingly possible not to be anything, but to be everything. 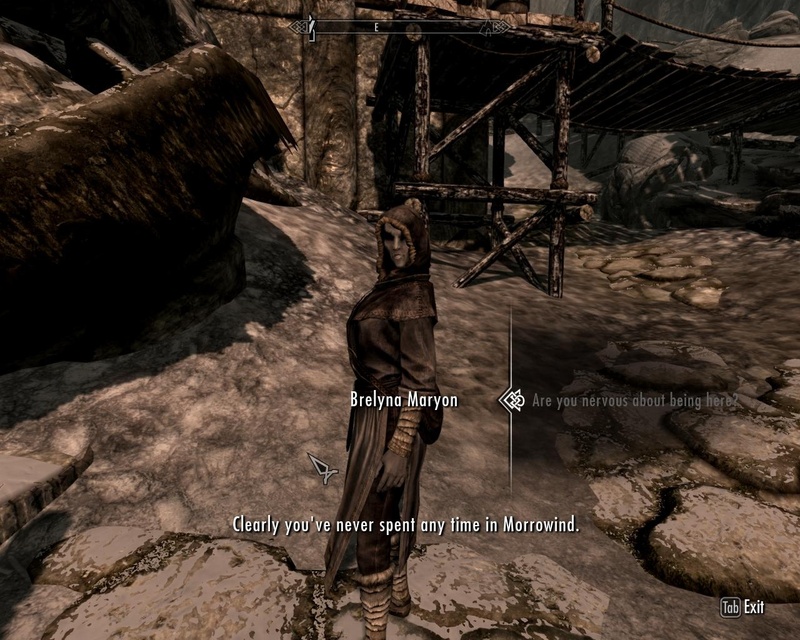 It doesn’t even require much effort (as evidenced by how you can get to being Archmage of Winterhold College without casting more than two most basic spells; though I guess that’s a narrative pressure not to lock any story off by a given play style and that’s a whole other kettle o’ fish). Which is why my desires are beginning to swing towards a more simulated approach. In Skyrim, the RPG elements dictate that, without ever seeing a Dwemer artefact, I can suddenly craft Dwemer armour. Why not instead lock that ability behind, you know, raiding a Dwemer city for the knowledge? What about reverse engineering the armour instead of just magically becoming able? Think about it. If I was a warrior, doing lots of warrior tasks, I’d end up focusing on that because I’d discover all the warrior techniques. If I was a mage doing all the Mage Guild duties, they’d teach me loads of spells and spell enhancements. It’d create a natural gradient rather than this strange mishmash of capabilities you can end up with; it might even create better quest variety as quest chains become centred around different methods of interacting with the world. 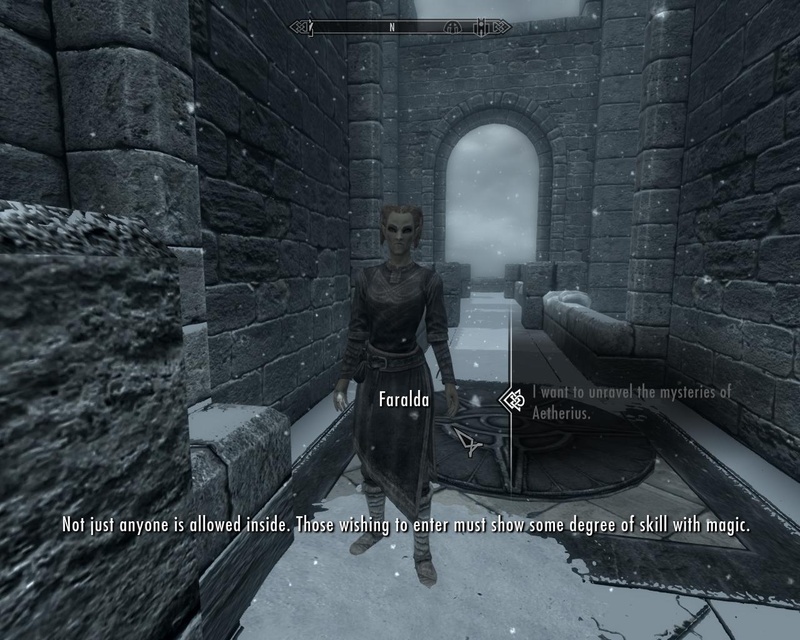 Hahahaha, oh Faralda, pull the other one. Even the basic Elder Scrolls RPG setup is already there — the more you do something, the better at it you get. As I said above, I like perks because they’re a tangible upgrade; they cause a very visible shift in your capabilities. But here, they just highlight how little of a traditional RPG the game is anymore. I think they need to bring back proper character attributes — which are physical, rather than the abstract Magicka/Health/Stamina triad we have now — and push perks into the world, to make them physical too. Of course, I could go further and mod the damn game myself. I’m not going to do that, though; I’m just going to bear in mind these thoughts as I work on my own games. No Excuses is not going to be an RPG, but it will be a physical action game. Can I coin a new genre, do you think? Something strung between the classic FPS and the classic RPG but not quite close enough to either. 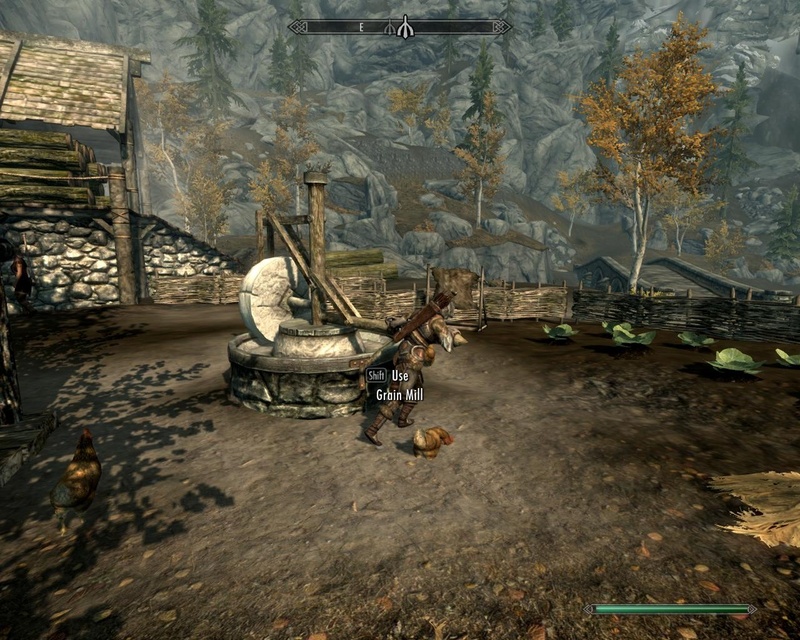 It’s all about the daily grind in Skyrim. 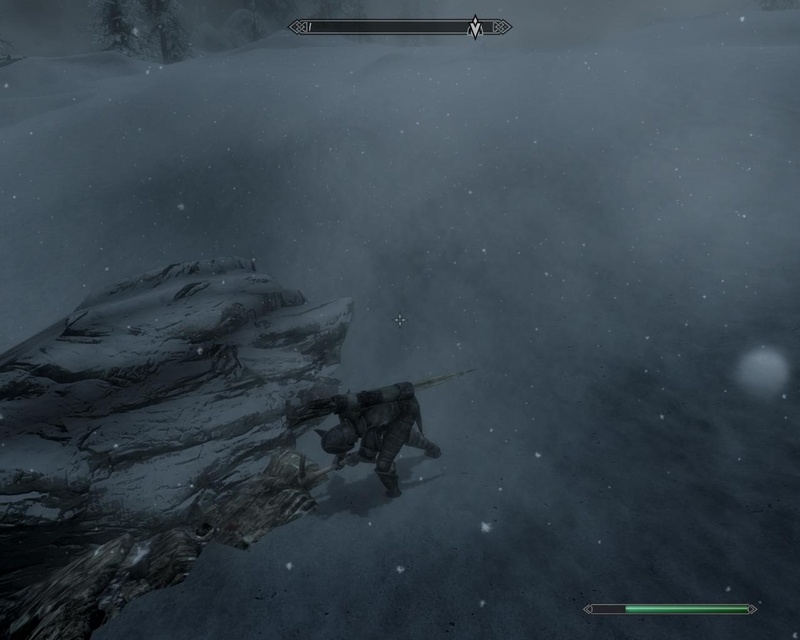 This entry was posted in Gaming and tagged attributes, Fus Ro Dah, games, gaming, perks, RPG elements, Skyrim, The Elder Scrolls by Rao Dao Zao. Bookmark the permalink. It’s interesting that you chose the term “less abstract” for character attributes. I can see where you’re coming from and yet, from a systems perspective rather than a role-playing perspective they are far less abstract. From a role-playing perspective I can’t really picture what it means to have more magicka/health/stamina, they’re just numbers and therefore abstract. If I told you your personal Strength was 38.7 (or, if you prefer, “good”) what would that mean? Your carry weight? Your dead lift? Your grip/leg/arm strength? Strength, wherever it’s used, is an abstracted concept. In game terms it’s a value that’s meant to affect multiple things. Meanwhile, magicka/health/stamina mean are exact things in game terms, it’s like listing your lift weight. In game mechanic terms what this means is that players have to spend more effort to decipher your abstraction. By eliminating strength you eliminate one element of the “stuff behind the scenes” that’s obscure to the player and make it unnecessary for them to figure out how the concept of Strength translates that to damage,carry weight,types of weapons, I can use, etcetra. This doesn’t mean it’s better, or even good, but I thought it was interesting to see how abstraction works in opposing ways here. Do you go with the verisimilitude of attributes or the pellucidity of stats is something I’m definitely going to keep in mind as I work on Sanguis. Yeah, of course it’s all abstraction, but I think reducing them to just Magicka/Health/Stamina, the “raw” values that mean something directly to combat, is an abstraction too far. That’s fine when you’re dealing with, say, an RTS where you’ve got a hundred units to throw around — but here, we’re focusing on a single character, so I think a little bit more complexity is warranted. Anyway, I’d definitely say the verisimilitude of attributes for a situation like this, because I can make the connection between the physical and the abstract more easily in my head if the layers aren’t too far apart. Maybe it’s just me. I sort of like the idea of rougelikes, but I’m always turned off by the turn-basis. Actually, I don’t really like the idea of rougelikes, I need a full story or I just flop around in the dirt and stop. And I’m rubbish with difficult things. So, uh, maybe not. It also allows you to set how you want your death system to be, though I don’t know if that includes infinite lives. The ‘adventure’ mode gives you a couple of lives with some more when you level up, but if you’ve spend all of them and die it’s game over. It’s a rather modernized roguelike, far more accesable than most that I’ve played, but it is still very much a roguelike: tread carefully or die. So on the story part you’ve got something to hold on to… but on the difficult part perhaps not. Hmm. Not sure I want infinite lives, but I don’t want death-is-the-end and a hideous difficulty curve. That’s why Project Y4 ended up with a lives system; if death occurs “too often”, then it’s more frustrating than challenging or fun when the penalty is so harsh (i.e. save and reload, or a rougelike, not even reload, just end). Not really my style.